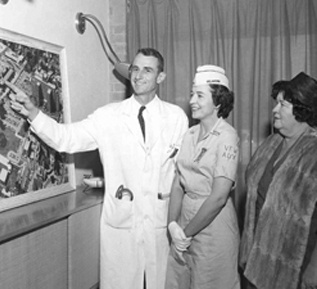 The University of Oklahoma Medical School Alumni Association study the possibility of establishing a research facility in Oklahoma. August 3rd. 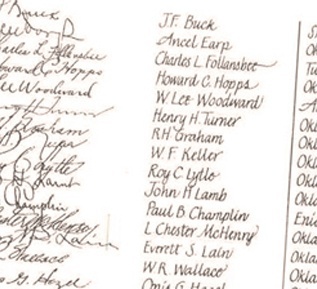 Articles of Incorporation are signed for the Oklahoma Medical Research Foundation. 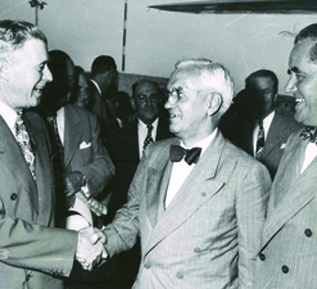 Governor Roy J. Turner (right) launched a fund drive that spanned all 77 of Oklahoma’s counties. 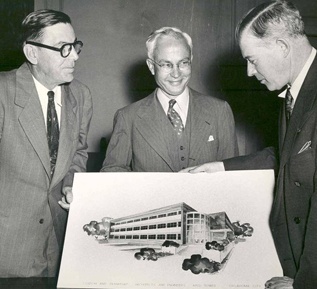 Sir Alexander Fleming (center) the scientist who discovered penicillin, made his first visit to the U.S. to dedicate OMRF’s yet-to-be-completed building. 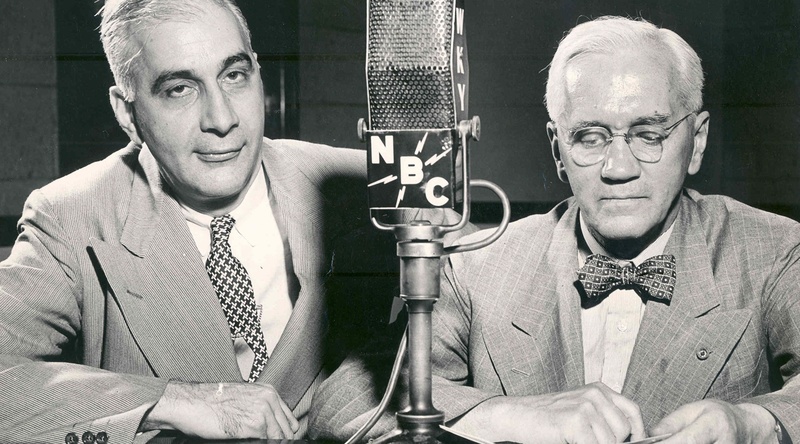 An estimated 2,500 people attended the ceremonies on July 4, 1949. December 17. 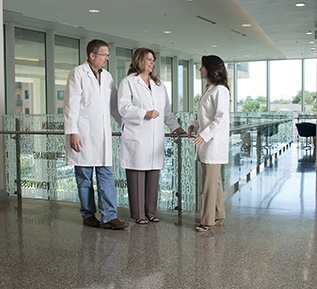 Five thousand Oklahomans attend an Open House for a newly dedicated OMRF research building. 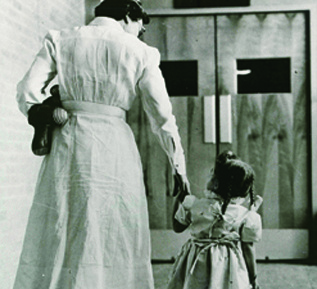 From 1951 to 1976, OMRF treated some of the state’s sickest children (most suffering from leukemia) in its research hospital. This tradition of patient care continues today in OMRF’s clinic. 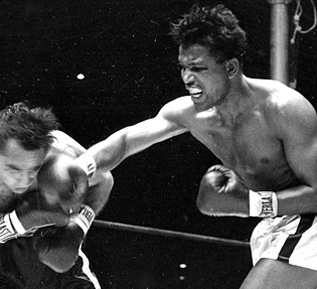 On April 19, 1951, world boxing champion Sugar Ray Robinson defended his crown in Oklahoma City by knocking out Don Ellis in the first round and $5,000 of the proceeds from the bout went to OMRF. 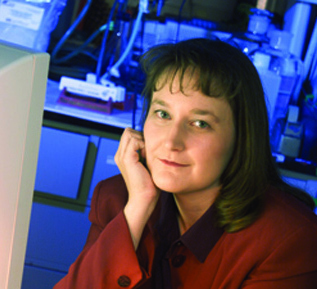 Dr. Mary Carpenter became the first female member of OMRF’s scientific staff when she joined the biochemistry section. 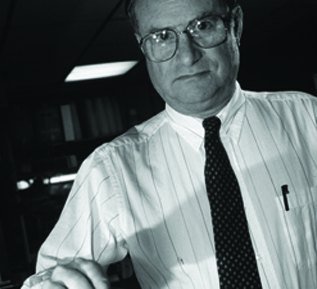 Dr. Carpenter became a noted expert on metabolism, prostagladins and biomembranes. 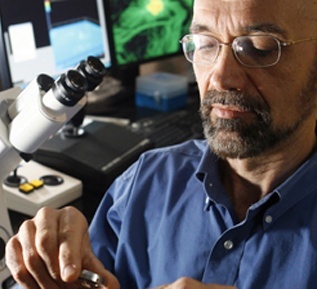 Dr. Leonard Eliel, head of the cancer section at OMRF is appointed Director of Research. He held this position until his retirement in 1970. 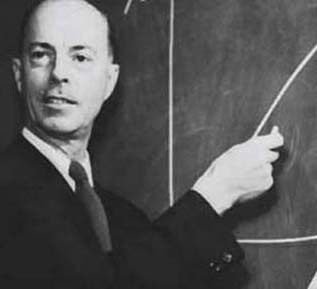 Seven students participate in the Summer Scholar Program originated by Dr. Charles Kochakian, the forerunner of today’s Fleming Scholar Program. 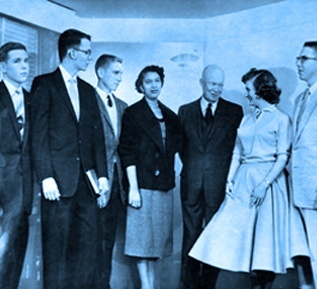 Pictured are six of these student with President Dwight Eisenhower. The OMRF chapel is dedicated. 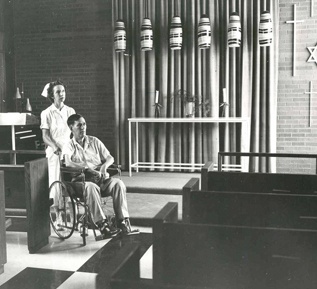 The chapel was built with volunteer time and materials. Much of the labor came from A.F.L. of Oklahoma. 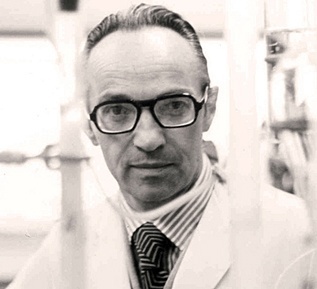 Dr. Petar Alaupovic created a classification and naming system for apolipoproteins which was later accepted as the international standard. These proteins subsequently have been found to play important roles in causing heart disease and stroke. 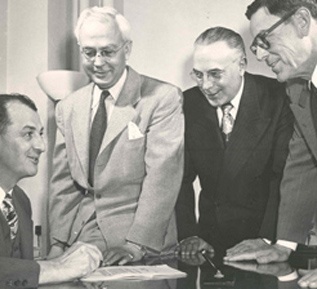 Hugh Payne (second from the right), OMRF’s first employee and the only administrator the foundation had ever known died in 1964. 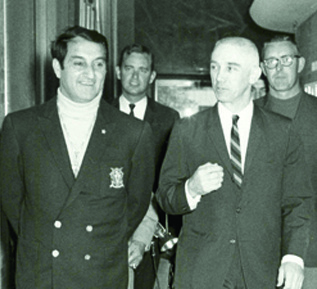 Danny Thomas (left) shown in a 1968 visit, is just one of the many celebrities who have joined the OMRF team over the years. OMRF’s celluloid heroes include Lloyd and Beau Bridges, James Garner and Larry Hagman, all of whom filmed public service spots for OMRF. 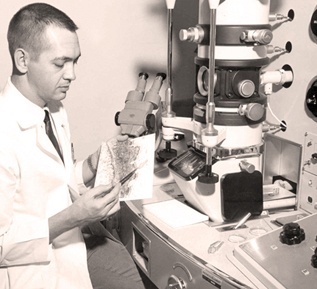 When Dr. Colin McLeod became OMRF’s first full-time president in 1970, it marked a watershed moment for the foundation. 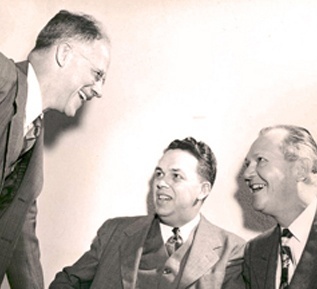 He brought the highest scientific credentials ever known in Oklahoma. Sadly his tenure was too brief. 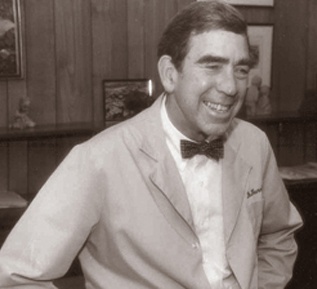 He died of a heart attack in 1973. 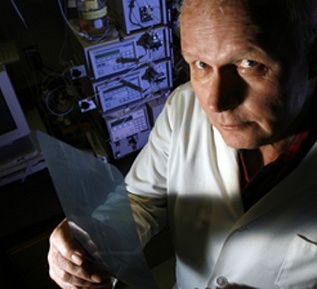 Robert E. Nordquist developed a strain of breast cancer cells that helped researchers worldwide understand tumors. 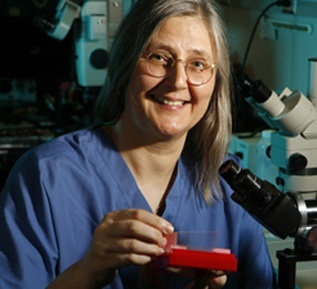 Dr. Shannon Lucid, a researcher in the Biomembrane Research Laboratory, was selected by NASA as one of the first female astronauts. 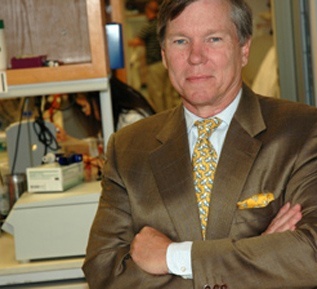 Dr. William Thurman takes the helm of OMRF and helps establish a solid base of competitive grant funding and a reputation for scientific excellence. 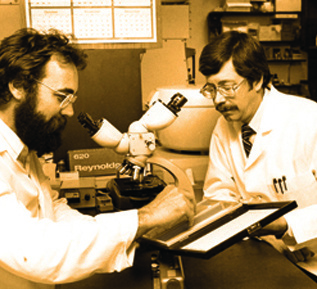 Dr. Paul Kincade came to OMRF in 1982 and in the years since, he has broken new ground time and again in the quest to understand how the human immune system develops and replenishes itself. Dr. Charles Esmon, scientist in the Cardiovascular Research Program, was named a Howard Hughes investigator for his work in blood clotting. 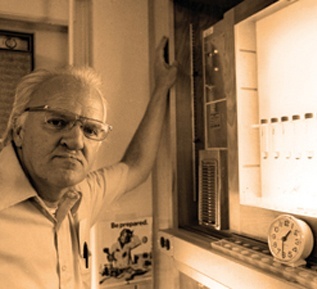 His work has yielded a part of lifesaving medications: the sepsis drug Xigris and Ceprotin for children suffering from a rare blood disorder. 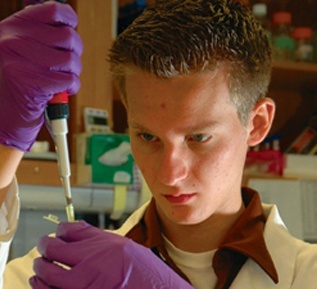 The first Science Open House was held at OMRF for high school students from around the state. Students and teachers toured the Foundation on the weekend to get a feel for the research and the facilities. In 1988, Dr. Fletcher Taylor and Dr. Charles Esmon filed for a patent on discoveries they’d made about how the blood clots. Thirteen years later, their work resulted in the first and only FDA approved treatment for a deadly blood infection. Drs. 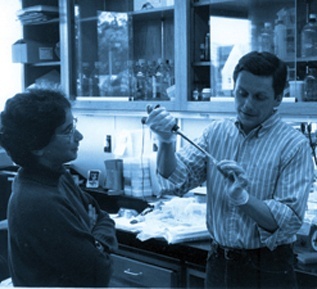 Joan and Ron Conaway discovered Elongin, a genetic transcription factor. Drs. 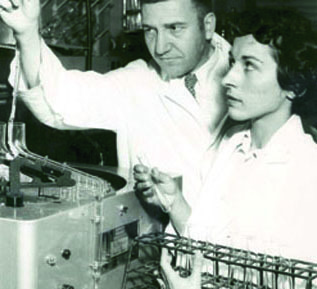 John Harley and Judith James made waves in the world of biomedical research when they established a link between Epstein-Barr virus (best known as the cause of mononucleosis) and lupus. 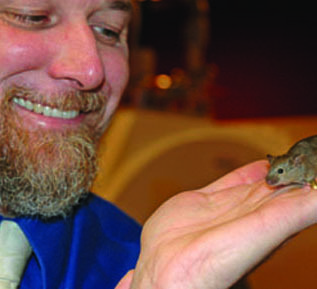 Dr. Ute Hochgeswender, Development Biology Research Program, designed genetically engineered mice with Dr. Miles Brennan from the Eleanor Roosevelt institute in Denver. Dr. Paul W. Kincade, head of the Immunobiology and Cancer Research Program with Dr. Kay Medina isolated limitin from bone marrow cells. This new interferon-like substance is able to limit tumor cell growth. Dr. Eldon Jupe and a team of OMRF researchers found that BRCA1 and BRCA2 genes may predict breast cancer risk in women. Drs. Judith James and John Harley published an important study that showed that certain antibodies for lupus were typically present years before the disease with diagnosed. 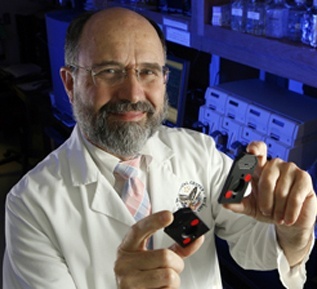 OMRF opened the state’s first small animal magnetic resonance imaging facility. It’s one of only a dozen such facilities in the entire United States. Scientists throughout the world now use this facility to study brain disease, heart disease, diabetes and cancer. 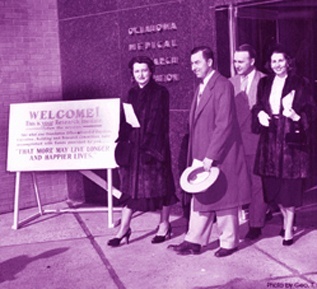 In September, OMRF celebrated its 60th anniversary. More than 600 people gathered to salute six decades worth of achievements and to get a glimpse of the possibilities that tomorrow holds. The next generation. 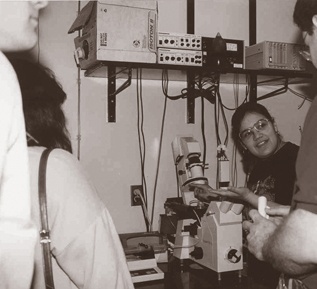 OMRF’s Sir Alexander Fleming scholar program celebrated its 50th class and continues to train the state’s brightest young science students to be the researchers of tomorrow. 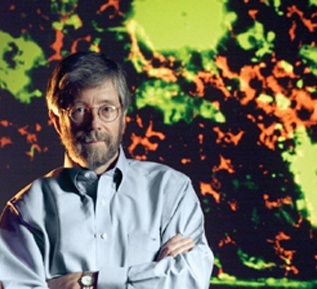 In 2006, a team of OMRF researchers led by Gary Gorbsky found a way to turn back cell division. The discovery, chronicled in Nature, could have important implications in treating cancer and birth defects. 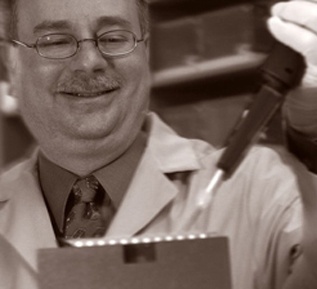 “OMRF is home to a group of scientists who are immensely talented and respected worldwide,” said Dr. Stephen Prescott when he took the reins as OMRF’s president in 2006. 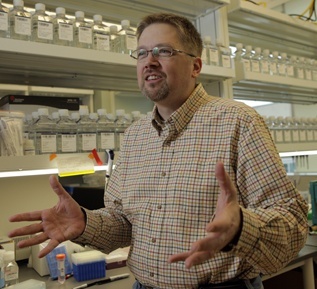 In 2000, Jordan Tang, Ph.D., led a team of scientists at OMRF that identified and cloned the enzyme believed to cause Alzheimer’s disease then created an inhibitor to halt the enzyme’s action. 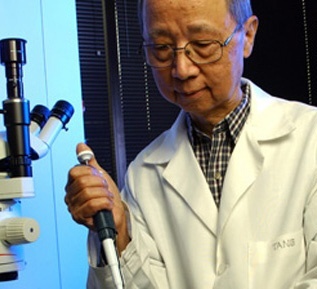 In 2007, human clinical trials of an Alzheimer’s drug based on Tang’s discoveries began. 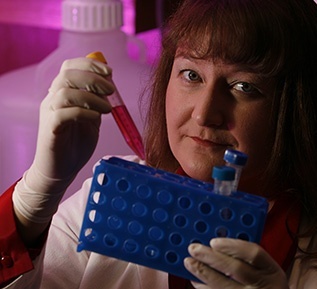 An outbreak of H1N1 or “swine flu” prompted government officials to contact OMRF scientists, Drs. 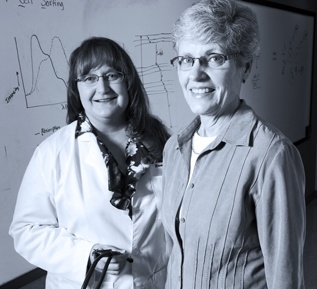 Judith James and Linda Thompson, to help them develop a vaccine. Drs. 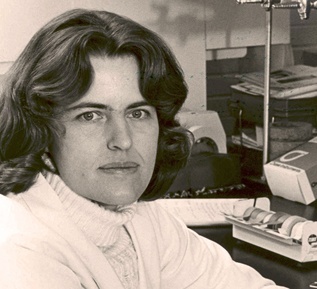 Kathy (Moser) Sivils and Patrick Gaffney led the largest genetic experiment ever done in the field of lupus research using data from 15,000 blood samples donated by lupus patients. OMRF’s Multiple Sclerosis Center of Excellence, led by Dr. Gabriel Pardo, opened its doors to more than 2,000 patients seeking comprehensive care for MS.
On April 21, at a ceremony led by Gov. 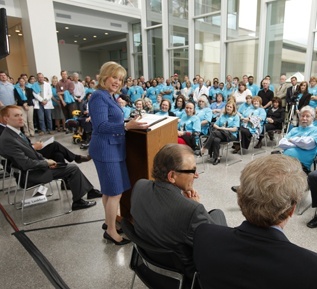 Mary Fallin, OMRF dedicated its new 186,000 square foot research tower. 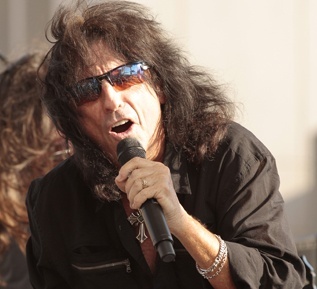 Rock and Roll Hall of Fame inductee Alice Cooper played a benefit concert at OMRF to raise funds for clinical trials for glioblastoma, a deadly brain cancer. Working with OU, OSU and tribal health authorities, Dr. Judith James secured a major grant that will help deliver more effective care to patients in rural Oklahoma. 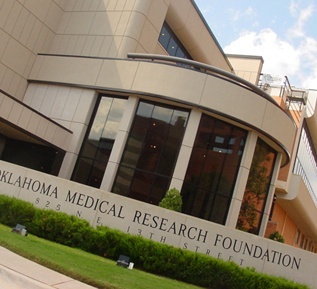 OMRF launched its first-ever clinical trial for Oklahoma cancer patients. 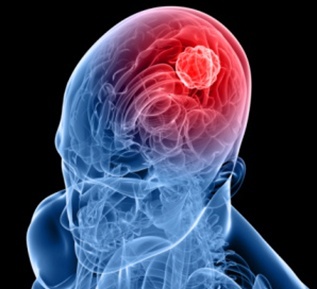 That trial gives patients suffering from a deadly form of brain cancer access to an experimental drug developed at OMRF. The watershed trial comes as a result of a partnership between OMRF and the Stephenson Cancer Center at the University of Oklahoma. For the second time, the National Institutes of Health designated OMRF an Autoimmunity Center of Excellence. 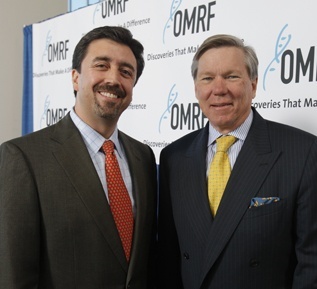 OMRF joins academic medical centers such as Harvard and Stanford as one of only 10 ACE sites nationwide. 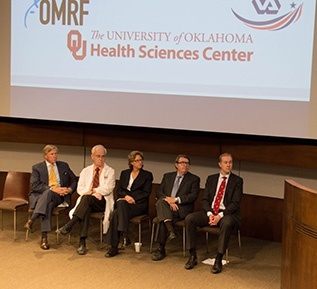 The National Institutes of Health awarded researchers at OMRF, the University of Oklahoma Health Sciences Center and the Veterans Administration Medical Center a five-year grant to establish the state’s first Nathan Shock Center of Excellence in the Basic Biology of Aging. 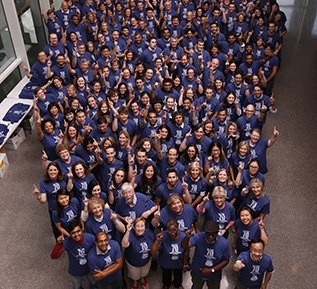 OMRF celebrated its 70th anniversary with champagne, cupcakes and commemorative t-shirts.